South Texas oil (brown) and gas (blue) wells. 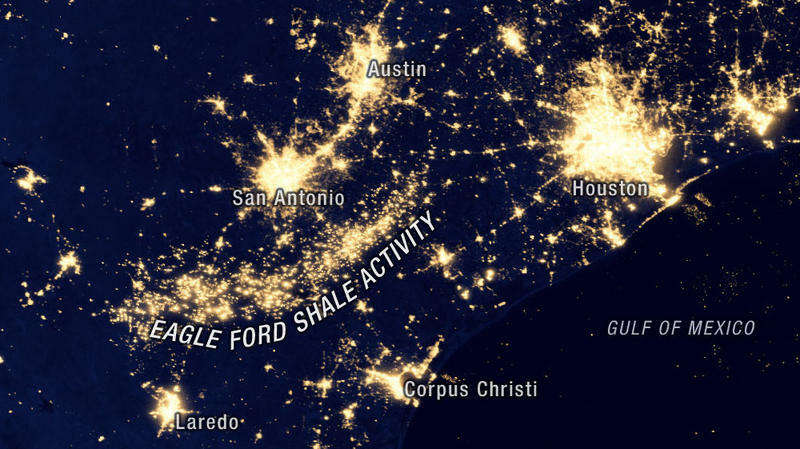 "It was transformational in essence," said Leodoro Martinez, chairman of the Eagle Ford Consortium, who said since drilling began property tax income in LaSalle County increased in the first year from $286 million to $2.2 billion, then to $4.4 billion in the second year. That number is expected to exceed $6 billion this year. Similar increases in property taxes and sales tax revenues are reported in counties across the area. "Like pipelines that are being laid out to go down to the ports, all the investments at the ports, and how it leads to the possibility for an increase in production of the natural gas," Martinez said. "People are now talking about the possibility of exporting a lot of this gas and things of that nature." Martinez said significant investments are going into development at the ports of Corpus Christi and Brownsville in anticipation of those exports from large stores of natural gas in the southern and mid-sections of the play. San Antonio elected officials, business and education leaders are scheduled to speak at the conference that includes breakout sessions that cover issues such as Eagle Ford health care, land use planning, workforce and training and traffic management. The conference runs through Wednesday at the Henry B. Gonzalez Convention Center. A loophole is letting hundreds of oil and gas companies emit a combined 8.5 million tons of toxic chemicals every year in America and they don’t have to tell the public anything about it. A new report by the Environmental Integrity Project has highlighted industry in Texas as being THE biggest polluter of the eight states they investigated, noting nearly 100 individual facilities releasing 10,000 pounds of toxic chemicals each year.